Colder temperatures are on their way – Edmonton’s already had its first snow of the year – and winter weather lovers are delighted. For those folks, when the mercury drops, their excitement rises and this winter the coolest cold-weather activity around isn’t skiing or ice skating. It’s camping! 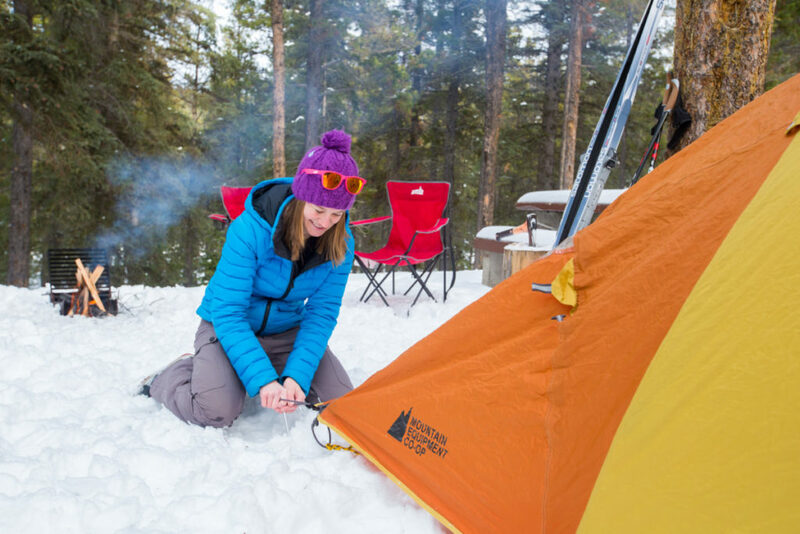 If you’re thinking about pitching a tent in freezing temps, you’re going to need the right gear to keep you warm, so don’t be caught unprepared. Pack your knapsack with these winter camping must-haves and stay cozy in the cold. Your most important defense against arctic outdoor temperatures is your sleeping bag and pad, because lying directly on the ground will leave you exposed to the most intense cold. We recommend a foam pad like the Big Agnes Third Degree pad, rather than an air-filled one for winter camping since foam provides better insulation than air. The Big Agnes pad is also heavily padded and features a dimpled top to trap warm air against your body no matter how cold it gets. Once you’re off the ground, you’re going to need a sleeping bag to keep you warm, and winter camping experts swear by a variety of below zero bedding options. If you’re looking at camping in extreme conditions, consider a Marmot-brand bag, either the Marmot Col -20, which is highly weather resistant, or the more affordable Marmot Ultra Elite 20. The Ultra Elite is only rated to 20 degrees Fahrenheit, but the bag has three layers that optimize thermal efficiency and overall comfort. There are plenty of tents that will guard against the worst winter weather, yet most of the time it’s the added elements that will keep you warm – your sleeping bag, your clothing, and proper tarp cover. During the winter months, you’ll want a heavy-duty tarp on the ground to keep out moisture, as well as added tarp cover over the door flaps of your tent to keep out the wind. And don’t forget, if you’re expecting snow or hail overnight, it can help to add another tarp above the normal rainfly to protect the top of your tent from precipitation. Finally, you can’t go camping in freezing conditions without the right jacket, and when it comes to extreme warmth, we put our trust in Columbia’s outdoor gear. Columbia is consistently on the cutting edge of weatherproof garment development. The company’s Omni-Heat Reflective technology and their OutDry Extreme tech items are both designed to handle extreme temperatures, including sports like skiing where your gear is bound to get wet. We recommend their Titanium OutDry Extreme, which waterproofed and filled with real goose down – and it’s surprisingly breathable, perfect for working up a sweat while hiking to your campsite. The popularity of winter camping is definitely on the rise, whether people are camping in their cars or an RV, or taking their chances in a tent – and we shouldn’t be surprised. After all, it’s part of human nature to pursue challenges, whether it’s the urge to hike the mountains of Nepal or trying to freedive to great depths. We’re driven by the adrenaline of these activities. Though there are certainly risks associated with winter camping, that’s part of the pleasure. If you’re equipped with the right gear, however, there’s no reason not to test your mettle against the cold.